It’s often difficult to separate your personal feelings from your objective review when enjoying a piece of theatre. Emotions strike you, plot lines stick with you, and talent surprises you. 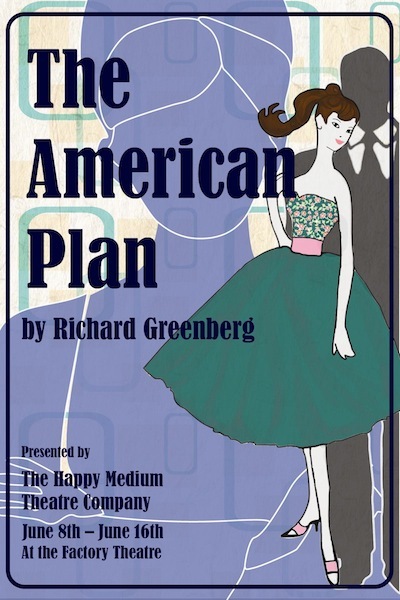 I was delighted to see The Happy Medium Theatre Company’s production of Richard Greenberg’s The American Plan. I’ve been a fan of Greenberg’s work for a number of years but his plays are rarely performed outside of college circles, and Happy Medium almost never disappoints, with a strong recurring company of actors. From an acting standpoint, this production didn’t disappoint, and the directing was some of the strongest I’ve seen in recent productions. Yet, something struck me the wrong way, and I remembered why I have a horrible aversion to the play. I apologize if this bias impacts my review. Director Melanie Garber offers some wise analysis for her production in the program; her lens for directing and viewing the show focuses on the stagnant nature of the characters. While I don’t agree that this interpretation is the only plausible approach, Garber does a magnificent job of achieving her objectives. The first scene is dynamite, and offers a quick-paced introduction to some of the play’s major characters. Robyn Linden is wonderfully effective as the young Lili Adler. She bounces with brightness and hope, but flutters between this energy and a darker place. Even before conflict is formally introduced, Linden is able to portray the melancholy and uneasiness within her character. These layers make her relationship with Nick Lockridge even more strong and dynamic. Nick Miller is incredibly charismatic as his namesake leading man, but his greatest achievement is holding onto his secret, slowly revealing the turmoil and angst behind his picture-perfect façade. All of his scenes with Linden zing with energy and purpose; honestly, the play was complete with their varying conflicts and tactics. Added to the conflict is Lili’s mother Eva, played by Audrey Lynn Sylvia. A powerhouse performer with such rich emotional range, there are very few older actresses more engrossing actress than Sylvia. Her ability to humanize and develop a character before the audience is truly amazing. Yet, I think Greenberg’s text lets her down in this role, as though Eva is missing some key scene or moment to help explain her relationship with her daughter. Script aside, Sylvia’s scenes with Miller are electric. They attack each other with purpose and drive, each fully committed to their goals, making the conflict so much more interesting, and the ending so much more heartbreaking. I would be remiss if I didn’t mention Mikey DiLoreto, who plays Gil Harbison. I adore the Gil that DiLoreto creates at the beginning of Act 2; Gil is smart, charismatic, witty, charming, and fun. DiLoreto shines at his finest in these foppish moments, which he grounds perfectly in a real person. It’s the best work I’ve seen him do, and DiLoreto has some fine experience under his belt. Yet, I hate the character and his role in the play’s plot. DiLoreto can hardly save this thankless and even antagonistic character from my unbridled hatred. I don’t hate his morals, values, or goals; I hate his purpose within the play and Greenberg’s unnecessary introduction of a subplot so out of left-field that you wonder if you walked into the right theater in Act 2. The set design by Sean A. Cote is particularly strong though slightly off-balance, maybe to signify a world slightly off. I really appreciated the simplicity and use of space for this production. I am always impressed with how companies manage to use the challenging Factory Theatre to tell their story and Happy Medium’s production of The American Plan is no exception. Jillian Clark’s costumes are smart, flattering, and perfectly reflective of the period- the dramaturg Jenna Stelmok and Melanie Garber did their homework with their design team. As usual Garber is particularly inventive in her direction. She creates wonderful whirl-wind scenes that keep the show moving at the perfect pace and stunning character relationships that breathe life into the playwright’s text. I will try not to criticize her for choosing such an awful work because, with her cast and crew, she does an amazing job of helping me forget my grudge against Greenberg for his play. 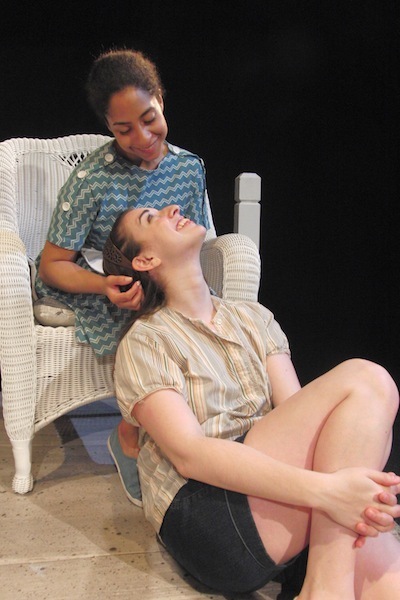 As usual, The Happy Medium Theatre Company is a star company that pushes the limits on the Boston theatre scene with bold, rarely performed works. and Romeo and Juliet by William Shakespeare, directed by Paula Plum from August 10 – 25.